forthcoming catalogue raisonné on Loiseau’s work. A certificate accompanies this work. It has been suggested that Loiseau’s style of painting falls somewhere between Pissarro and Sisley. In many ways it was Monet who had the greatest influence on Loiseau and with whom we see a natural relationship in their brushwork and interests. He was also influenced by such painters as Gauguin and Maxime Maufra. Ultimately Loiseau experimented with his own ideas, and he stands as an Impressionist with a strong personal style. Loiseau’s landscapes reflected an Impressionist vision with a Divisionist style. Loiseau found his “pure painting ideals” in his Post-Impresssionist style of painting derived directly from the observation of nature first-hand. He had a particular interest in the depiction of water within a landscape, of which our picture is a very fine example. Born to shop keepers who moved to Ile-Saint-Louis in Paris shortly after he was born, Loiseau acquired only a basic education, as he was expected to help with the store at an early age. In his free time the young boy would sketch and do copies of prints. After a serious illness he convinced his parents to allow him to pursue his artistic inclinations, and thus Loiseau became an apprentice to a decorator. Through this experience the young boy met painter, Fernand Just Quignon, who would become his first real instructor and inspiration to focus on landscape painting. In 1890 Loiseau moved to Pont Aven where he befriended Maxime Maufra, Emile Dezaunay and Henry Moret, who influenced his Impressionist style and convinced him the exhibit his paintings at the Salon des Indépendants in 1891 and 1892. 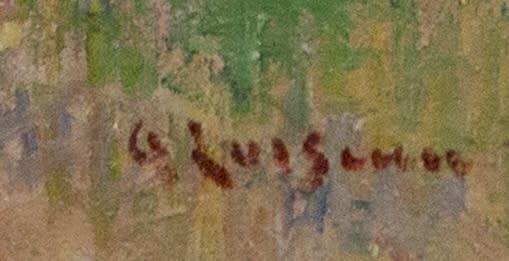 In 1894 Louiseau met Paul Gauguin after his return from Tahiti, and a deep friendship grew between the two artists. Loiseau traveled often throughout the countryside of France. 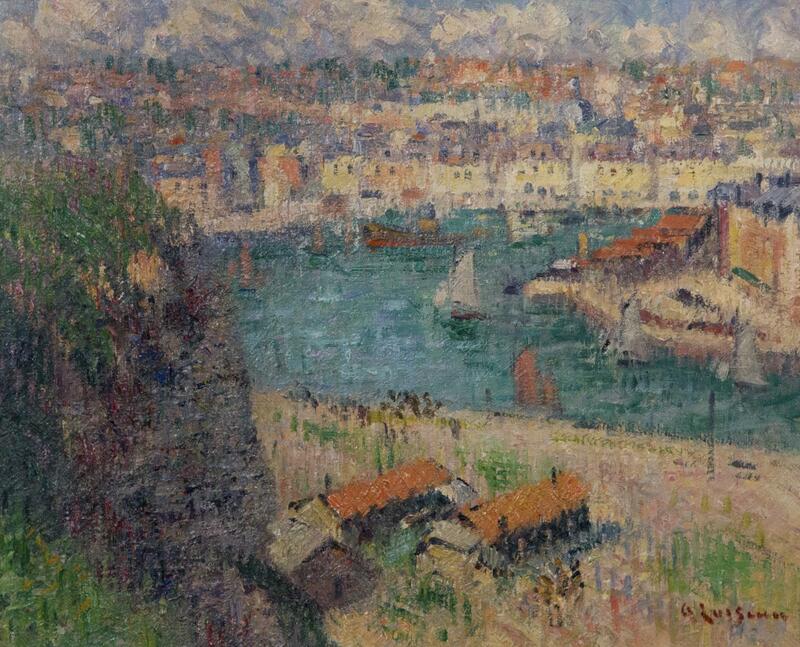 He liked to paint in series, much like Monet, and attempted to capture scenes in different times of the day. He chose to depict the transformations in nature caused by changing light. Sensitive as he was to every nuance, he refused to paint in the glaring midday light – bright colors hurt his eyes; he preferred softer, subtler scenes –afternoons when the sky is dotted with clouds, the soft golden light at the end of the day, morning fog and evening mists and the dreamy effects of snow. Between 1901 and 1929, Loiseau made at least five visits to Dieppe on the northern coast of France, directly north of Rouen and west of Amiens. Here, he painted numerous views of the town and its port. He had first ventured out of Paris in 1890, when he traveled to Pont-Aven in the footsteps of Gauguin. Following that trip, Loiseau spent summers painting the landscapes of Normandy, Brittany, and Dordogne. He developed a painting style that incorporated elements of both Impressionism and Post-Impressionism, characterized by short, interlocking brushstrokes that created an intricate, lattice-like structure. L’Avant Port de Dieppe is a fine example of this technique and of Loiseau’s attention to the effects of light on the landscape. 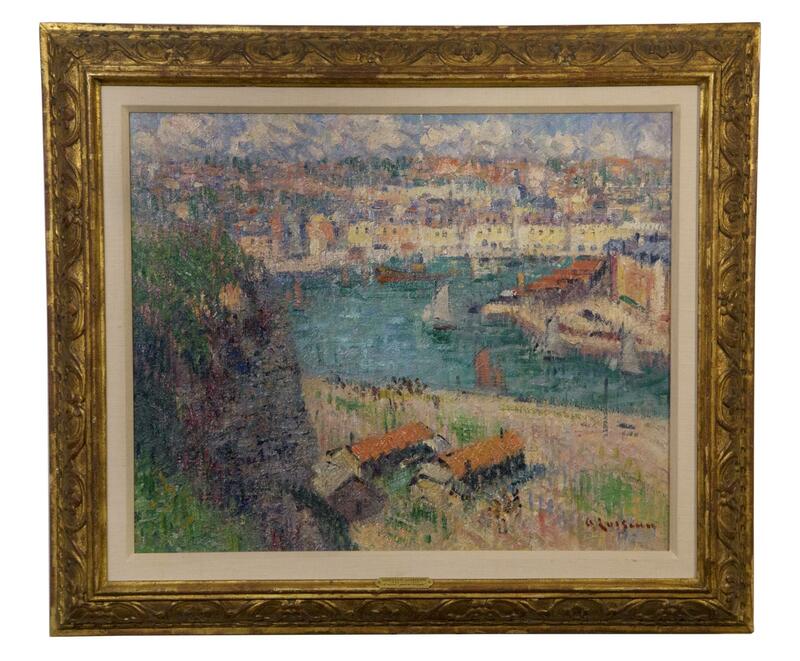 Please notify me when works by Gustave Loiseau become available.